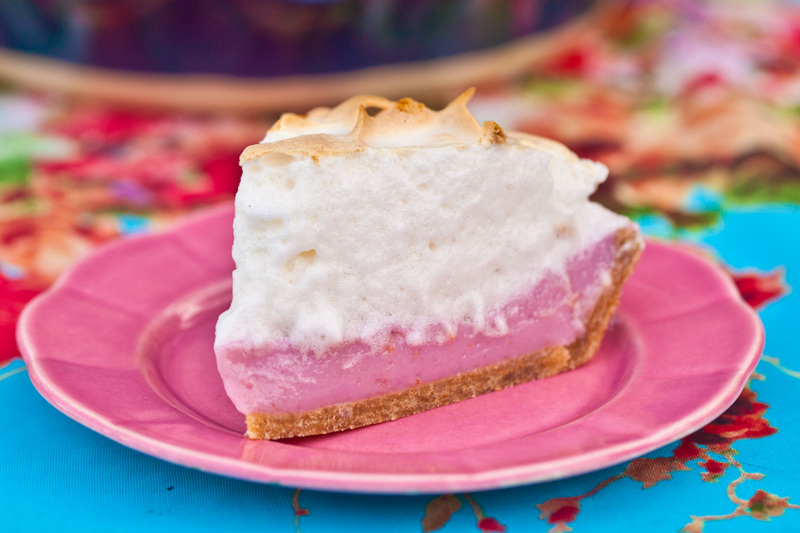 Vegan Pink Lemon Meringue Pie, it’s sound like sorcery, right? It is! This Vegan Pink Lemon Meringue Pie was made with vegan magic known as aquafaba, the water from a can of chickpeas. It whips up into the fluffiest most perfect meringue I have ever tasted, with not even a hint of chickpea flavor at all. It’s marshmellow-y and delicious. The only thing better than vegan meringue? Putting it on top of a pink pie, of course! I made this Vegan Pink Lemon Meringue Pie for a couple of our super awesome friends and Kickstarter backers. They got to choose their favorite recipe for me to make a vegan version of. (Thanks for the challenge, y’all!) They gave us a choice between Banana Cream Pie and Lemon Meringue Pie. I tried two different (failed) versions of a Banana Cream Pie before switching things up. The first attempt was a raw version that tasted wayyyy too healthy. My second try at Banana Cream turned brown in my Vitamix. Needless to say, the thought of making another Banana Cream Pie made me want to climb under the bed with my cat and never come out. So, what’s a girl to do? I had quite a few pink lemons in my fridge (I am obsessed with all things pink and purple), so I thought why not go with the other choice, but make it PINK? 🙂 Thus, this Vegan Pink Lemon Meringue Pie was born. The pink lemons turned out to look more like grapefruit than a deep, rich pink. I added some raspberry juice for extra color and flavor and a couple of drops of natural pink food coloring for fun. Let’s talk about this pie crust! It’s whole wheat and made with lemon flavored vodka, so you know it’s going to be amazing. It’s flaky and delicious, and only takes a few minutes to prepare. The recipe for this Vegan Pink Lemon Meringue Pie and flaky whole wheat crust is adapted from NamelyMarly.com, a delightful vegan food blog with tons of vegan cooking and baking tips. I could not even believe how good this Vegan Pink Lemon Meringue Pie tastes! Normally I’m capable of restraining myself around pie, but this baby, oh no. I ate two slices of this pie PER DAY until finally giving the rest away. It’s that good! It’s pink, it’s fluffy, this Vegan Pink Lemon Meringue Pie just might be the best pie I’ve ever had. The perfect Vegan Pink Lemon Meringue Pie- flaky pie crust with tart lemon raspberry custard, topped with sweet, fluffy vegan meringue. Crust- Pour 1½ cups flour, salt, and sugar into a food processor and pulse until combined, about 2 seconds. Add vegan butter and process until just combined. Add the shortening pieces and pulse until dough clumps together, about 15 seconds. Shape the dough into a ball balls and flatten it into a disk. Wrap in plastic wrap and refrigerate at least 30 minutes. Preheat your oven to 350. Roll your dough into a wide circle about ⅛" thick and press it into a 9" pie pan. Pinch the edges of the crust into a pretty design and pierce the bottom with a fork a few times. Bake the pie crust for 10-12 minutes, until golden brown. Meringue- Pour the liquid from a can of chickpeas into the mixing bowl of a stand mixer fitted with the balloon attachment. Add the cream of tartar and mix at medium high speed until the mixture becomes frothy, about 3-4 minutes. Meanwhile in a food processor, process the sugar for 30-45 seconds so it becomes fine like caster sugar. Mixing the chickpea water on medium high speed, add the processed sugar one tablespoon at a time. Continue mixing until soft peaks form. Add the vanilla and continue mixing until stiff peaks form. If you don't have clear vanilla, skip this step. It will still taste amazing! Add the xantham gum to help the meringue keep stiff peaks. Mix for another minute or so, then spoon it onto your pie filling. Filling and Pie- To juice the raspberries, I blended them then strained the mixture through a cheesecloth. You can also substitute ⅓ cup of red fruit juice (pomegranate, strawberry, etc). In a small saucepan combine the sugar, flour, cornstarch, and salt. Stir with a whisk to combine. Turn the heat to medium-high and add the water, lemon juice, lemon zest, raspberry juice, and agar agar agar flakes. Stir occasionally, to make sure the custard doesn't burn. Bring this to a boil and then reduce heat to medium and simmer for 3-5 minutes, until you have a thick mixture in the pan. Remove from heat and add the tablespoon of vegan butter. Stir to combine. Set aside. Place the tofu in a food processor and pulse until smooth. Add the lemon mixture from the saucepan and pulse it all together until a smooth consistency is reached. Prepare the meringue according to the recipe below and heat your oven to 350. Place in your heated oven and bake for 15-22 minutes until the meringue just begins to brown. Turn your heat to 375 and cook for another 5-10 minutes until the meringue has golden edges. If you are using agar powder instead of flakes, use ⅓ the amount or the texture will be off. Be sure to place the pie in the oven right away or the meringue may become deflated. It is very important to let the pie come to room temperature then chill before serving or the filling may be runny! Did you try this Vegan Pink Lemon Meringue Pie? Leave us a comment and tell us about it? While you’re at it, post a photo to Instagram with the tag #carrotsandflowers 🙂 We can’t wait to see how your vegan meringue turns out! If you enjoyed our Vegan Pink Lemon Meringue Pie recipe and just love fancy desserts, you’ll love our Vegan Lemon Raspberry Cake and our Vegan Red Velvet Cake. If you want to save this recipe for later, pin the photo below! You ROCK! I am in love with this beautiful creation but we can’t have soy. What can I substitute for the tofu? Thanks for the comment! The agar will be enough to get a thick creamy filling, although I haven’t tested the recipe without the tofu. My suggestion would be to slightly increase the amount of ingredients (water, lemon, raspberry, sugar, flour, and agar) to make up for the missing cup of tofu. I think 30% additional would be a good place to start. Hope this helps! Hey! 🙂 What a beautiful recipe!! I tried it at home but failed miserably.. 🙁 The meringue was flat by the time I took it out of the oven and the filling was more chewy but too runny at the same time. Do you have any idea what could have gone wrong? I would love to try it again. I’m so sorry this recipe didn’t turn out for you! I’m trying to think of what the problem could have been, as I’ve made this several times successfully. Did you use agar flakes or powder? I just recently learned about agar powder (before I had only seen flakes). From what I heard, agar powder requires only about 1/3 the amount necessary or it becomes too thick. It sounds like that could be the problem and also maybe it needed to cook longer? For the meringue, did you add the xantham gum and cream of tartar? That’s the only way I’ve had success. Also, unless you put the pie in the oven right away, it does tend to become deflated. Again, I’m so sorry this didn’t work for you. I’ll update the recipe to include these additional notes for more success next time! Thank you for the answer! 🙂 Yes I saw the comment about the agar agar flakes and powder and only added 1/3 as I have the powder. I did not have xantham gum and cream of tartar but I researched the substitutes we have here, where I live, and used those.. I threw the deflated meringue away and left the cake in the fridge over night, the next day I just whipped up the meringue again (same recipe) just added a pinch of salt and put it on top of the cake and back in the oven for about 8 minutes and it turned out perfect! 🙂 And the filling had a better consistency the day after. 🙂 I am guessing that somehow the wetness of the filling was making the meringue flat, I am not sure.. I will try it again soon, even though I failed a little, the cake was everyones favourite!! 😀 Thanks so much for your recipes, they are awsome!! I cannot believe you haven’t won an award or something. 🙂 I hope you have a good they. Greetings from Switzerland. what is the temperature for the oven in the uk, is it still the same? Ria Murrell, the temps in this recipe are Farenheit. It would be 180C, or Mark 4 I think on the ovens in the U.K. Thank you for sharing this recipe! I made it last summer for a group of omnivores and they were stunned when I told them what the meringue was made of! I would’ve shared the photo, but I don’t know how to use Instagram. I was just reviewing the ingredients, and I’m confused about the flour measurement. It calls for 1 1/4 cups flour, but in step 1 it says to mix 1 1/2 cups of flour, and then step 2 says to add the remaining cup of flour? I don’t know how I figured out how to make the crust last year, but somehow it turned out great!